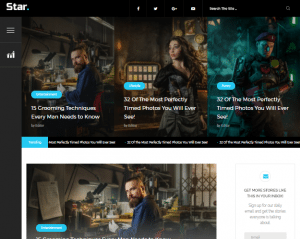 Star is a highly popular magazine theme that can be used to create movie reviews, gaming, technology, sports, or personal blogs. The dark color scheme and stylish homepage design will help you draw the attention of your visitors. The unique menu navigation menu is hidden under a hamburger icon, which is located on the left side of the page. It is followed by a dedicated section for checking out the trending articles. There is a built-in news ticker that can be used to let the visitors know about the latest posts, events, promotions, or other updates on your website. Take full advantage of the custom ad space on the homepage and single posts. The theme offers four post styles, which means can publish your content in various styles and keep the visitors engaged. The social sharing buttons are provided with the share count feature. This is a handy trick to help the visitors gauge the popularity of the post and to get more shares for your content. Star is provided with several custom widgets with attractive styling. It is possible to display detailed information about the author by using the about author section. Other features like related posts, previous, next posts will help the visitors to explore more content. Thanks to nicely organized threaded comments, they will be more encouraged to participate in the conversation.